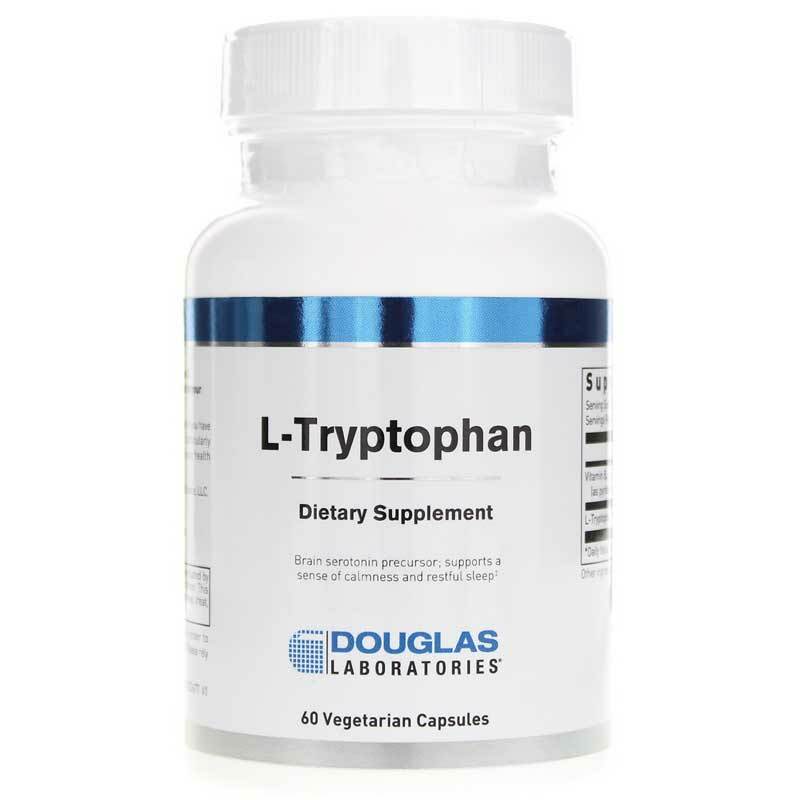 L-Tryptophan from Douglas Labs supplies 1000mg of pure L-Tryptophan plus other synergistic cofactors in two vegetarian capsules. Tryptophan may be a useful dietary supplement for individuals wishing to support neurological function and healthy emotional wellbeing. Additionally, as a precursor of melatonin, serotonin is involved in regulating sleep patterns. Serotonin is unable to cross the blood-brain barrier and is therefore synthesized in the brain. Tryptophan, an essential amino acid, is a precursor for the synthesis of serotonin. Tryptophan crosses the blood-brain barrier and is converted to L-5-Hydroxytryptophan (5-HTP), which in turn is converted into serotonin. Vitamins B2 and B6, niacinamide and Vitamin C are necessary cofactors to ensure the proper synthesis of serotonin. 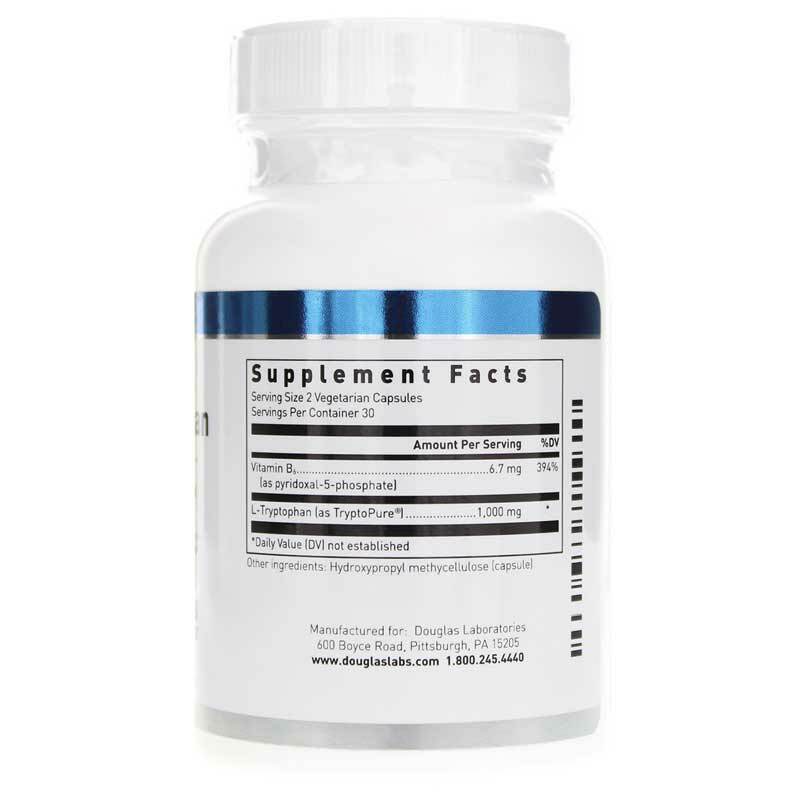 Studies indicate that supplementation with L-tryptophan may support healthy mood and restful sleep. * Other studies indicate L-tryptophan may support womens emotional well being before menstruation. * Additional research indicates L-tryptophan may be helpful in supporting healthy relaxation and occasional food cravings. Contains NO: yeast, wheat, gluten, soy protein, milk/dairy, corn, sodium sugar, starch, artificial coloring, preservatives or flavoring. Adults: As a dietary supplement, adults take 2 capsules daily or as directed by your health care professional. 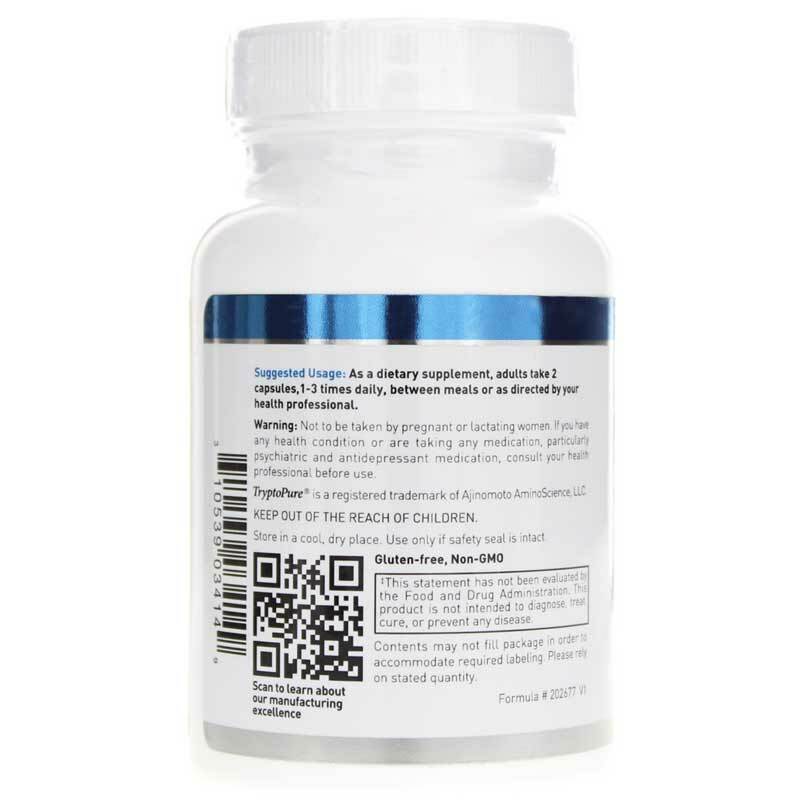 If you are taking medications for neurological conditions including Selective Serotonin Reuptake Inhibitors [SSRIs] or Monoamine Oxidase Inhibitors [MAOI], or are pregnant or nursing, do not use this product. Keep out of reach of children. TryptoPure+é-« is a registered trademark of Ajinomoto AminoScience LLC. I expected each of these capsules to be 1000 mg of L-tryptophan. However, you have to take 2 capsules to get 1000 mg, so they are actually 500 mg each. You end up paying more than expected for each serving and I thought this was a deceptive practice. Why not just list them as 500 mg capsules? I wrote Douglas Labs about this, but their response showed that they did not think this was a problem. I am now taking a brand of L-tryptophan that I really like, and it is actually 1000 mg per caplet.